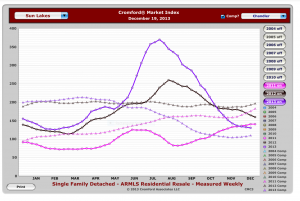 You are here: Home / Chandler AZ Real Estate / Sun Lakes Arizona – Buyer’s or Seller’s Market in 2014? Sun Lakes Arizona – Buyer’s or Seller’s Market in 2014? Sun Lakes is a Robson developed active adult community that borders Chandler in the East Valley. It is conveniently located to all major freeways and a short distance to both Sky Harbor and Mesa Gateway Airports. With just under 10,000 homes in five separate communities, it is consistently the top choice for those seeking a mild winter climate with an active lifestyle with fantastic amenities. Currently there are 168 homes for sale in Sun Lakes Arizona. That is less than 2% of all homes and is still considered low inventory. The strong selling season in Sun Lakes is January – April of each year when the majority of people are here and looking for homes. Sales are still fairly strong in May and into June and then they fall off through the summer and pick up again in October and November. Except…there is always an exception…in 2013 the inventory was very low with just under 80 homes on the market and buyer demand remained strong. Sales were brisk through the summer as buyers watched from afar and were prepared to make a trip to the hot desert if a home came on the market that fit their criteria. That buyer demand has slowed. Take a look at the report and you will see a market index for Sun Lakes Arizona as compared with Chandler Arizona. Sun Lakes is the solid line and Chandler is indicated with the lines with triangles. We compare the two as we tell our clients Sun Lakes is a “niche” market and doesn’t always follow the market trends in non-active adult areas. That certainly was the case in 2013 when the index rose in August to over 350 and immediately began a slide to 130 at end of year. Now, what does the index mean? 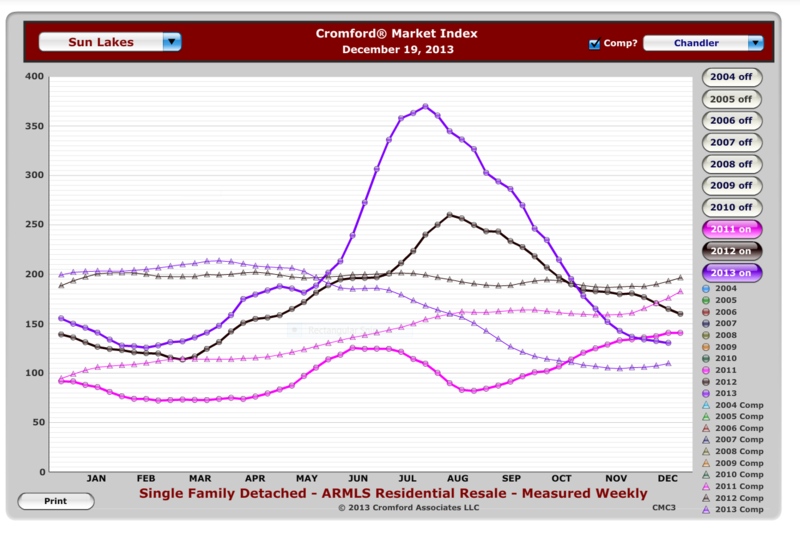 We subscribe to the Cromford Report – a real estate tracking and analysis service. The market index provides a short term forecast for the balance of a particular market. Values below 100 indicate a buyer’s market and above 100 is a seller’s market with 100 being a balanced market. So Sun Lakes is still considered a seller’s market with an index of 130 but demand has fallen sharply since the end of summer. Will that trend continue? Well, we don’t have a crystal ball but indicators are the market is cooling. Phoenix led the nation in growth the past two years and moving toward a balanced market is a good place to be. More sales are traditional with little short sale and lender owned activity left – especially in Sun Lakes. Sellers are in a good place with the index at 130 but it is a time to be realistic with pricing a home. Overpricing will not work. Today’s buyers are educated and do their research online. A good buyer’s agent will run comps and know how to counsel a buyer in making an offer. A good listing agent will be doing the same for their sellers and needs to be able to support a listing price with solid comps. A home that is in good condition, a good location and priced at market will sell. The KOLB Team are experts in Sun Lakes Arizona real estate. Each of us live in Sun Lakes, are active in the community and know the real estate trends and market. If you are considering buying or selling, contact us first! We can help you with professional counsel about the real estate market in Sun Lakes or any active adult community in the East Valley. See our Sun Lakes community and listing videos on our You Tube Channel.